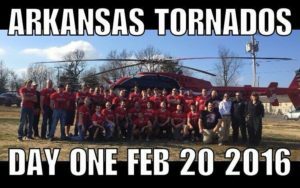 With less than 10 seconds left in the 4th quarter during the DCFL playoff game it was easy to sum up the first season in the history of the Arkansas Tornados football franchise with just four simple words. Heart. Determination. Perseverance. Unity. The scoreboard showed we were going to lose by a wide margin yet the faces of the men on the field showed a resolve to fight until the final whistle. They could have taken it easy and coasted through the final minutes but, as expected from those who had watched them play all season, they chose to stand tall in a symbol of unity, brotherhood and family. As I watched from the sideline, beneath the lights and in front of the jubilant Tornado faithful, a line from the old baseball movie, Field of Dreams, came to mind. If you build It, they (he) will come. It was clear to me that even in defeat this team and this season was a resounding success. The hard work from the players in practice, the dedication of the ownership and more than a few late night hours of game planning from the coaches all combined to bring a final product to the field that the community could be proud of and would support. Back in January or February of 2015 I received a call from Eddie Elliott. He explained that he and Bob Van Haaren were starting a semi-pro football team in Mountain Home, Arkansas and asked if I would be interested in coaching. My first inclination was to laugh because, really, there are much better football minded people in the area. We talked about some different options and settled on me coming aboard for strength and conditioning. This was an area that I felt fully confident in and knew that if I could train ultra runners to go distances from 31 miles up to 100 then getting players ready for four quarters of football would be within my capabilities. I made it to my first practice with a preconceived notion that these guys would already be in shape and would simply need a little fine tuning. That was very naive of me and I was suddenly very thankful we had almost a full year before the season started. Unfortunately, we had a lot of work to do in recruiting players. For the next few months and into the summer the Tornados consisted of 10-15 players. They weren’t always the exact same 10- 15 players either although there was a core group that showed up consistently for our once a week practices. There were times when I truly wondered if I was on some local version of the show “Punked” but I was excited about the idea that this might all somehow work itself out and become the real deal. I’m not sure when it happened but sometime towards the end of summer our offensive coordinator had to leave the team due to a job change. Over the next couple of practices I filled in and soon it became evident to me that I was the replacement. 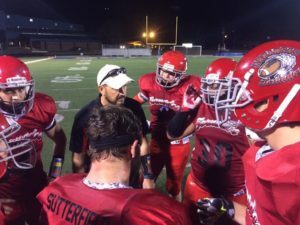 At first, I wasn’t sure that his was going to work or that I had any real interest in taking the helm of offensive coordinator on a first year (or any year for that matter) semi-pro team. My experience was limited to one year of high school ball and a few years of coaching little kids in the Ozark Football Association league. But with everybody looking at me for the plays I quickly adapted and became comfortable with the role. Over the course of the next few months I would experiment with different offensive schemes in an attempt to solve the riddle of which was best suited for the players and talent level we had. Our defensive coordinator, Jason Reiss, was a huge help during this process pointing out talents and strengths in several different players. Over the course of the past year we have spent many hours working together and I am proud to call him a friend. Things came together fast over the last months of 2016 and we soon had enough players to truly commit to making the upcoming season a reality. Eddie and Bob, along with many of the players, worked hard to bring in sponsorship dollars to purchase equipment and jerseys. I can honestly say that I have never met a person like Eddie Elliott. He never showed a sign of stress or worry despite the grim outlook that we faced for many months. He said it would happen and it did. I have a ton of respect for his drive and follow through. I’ll never forget how excited the players (and coaches) were to finally have a full contact practice. I remember it as a thing of beauty. The popping of pads and cracking of helmets on a crisp fall day that filled the empty stadium with the sounds of gladiators going to battle. Or some nostalgic nonsense like that. In reality it was kind of ugly with all the amped up testosterone that had been building but, thankfully, nobody was seriously hurt. The Tornados were ready to play. Almost. As we came closer to our first preseason game I felt pretty confident. We were slated to be playing in the DCFL, a developmental football league of the CFL. This was for first year teams or teams that weren’t ready to compete with more established teams of the CFL. I felt like we had a great opportunity to take advantage by playing in this league. Sure, the offensive line was inexperienced and undersized but we had some great talent in the backfield and I hoped that would overcome our inexperience on the offensive line. Of course, I just didn’t want to admit what I already knew…. I always preach to the pee wee kids that everything starts up front and we cannot win without a solid offensive line. Football is like no other sport. Every single player has to execute in order for any given play to have success. Once in awhile, a great running back or quarterback will find a way to overcome errors and weaknesses that have been exposed but that is not the norm. The majority of the time it takes everybody working together in perfect synchronicity for a play to evolve and reach its full potential. Our first preseason game against the DCFL Arkansas Raptors came and the stands were packed. People came from all over to check out this new team. 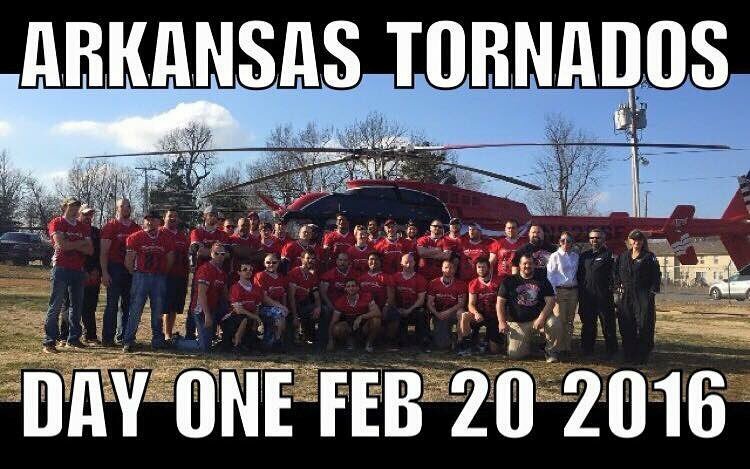 The Arkansas Tornados were confident and ready to play. When it was all said and done we had 30 plus penalties, lost our starting running back in the first quarter and the scoreboard showed 13-0 favoring the Raptors. Defensively, Jason had the team firing on all cylinders. Offensively, we were a mess. Every time we moved the ball 3 yards forward we would have a penalty and take it back 5. Nothing was clicking. Guys were jumping before the snap, running the wrong routes, snaps were on the ground and the offensive line was destroyed. When Todd Bowman, our starting running back, took a shot to the knee in the first quarter and was knocked out for the season, I did not have a backup plan and didn’t adjust. That was 100% on me. Our QB, Tommy Fellicia, did everything he could to keep us competitive but the play calling was limited as I tried to adapt and find a suitable replacement. After the game I felt like I had let the team and an entire community down. Fortunately, I have a background that doesn’t let a little failure bring me to my knees. I served in the U.S. Marines and to this day still live by the two mottos I learned. Semper Fi is popular and well known to most. It is short for Semper Fidelis which means “always faithful” in Latin. The other motto is a little more obscure but has great meaning to those who have served. Improvise. Adapt. Overcome. These three words let us know that things won’t always go as planned but quitting is not an option. When things go bad, and they usually do, you find another plan of attack and accomplish the mission. I have carried this attitude with me through my adult life in running and it has helped me to accomplish many Boston qualifying marathon times, a Missouri Age Group State Record for the 50 mile distance and 5 sub 24 hour 100 mile trail race finishes. I know that quitting isn’t an option and hard work will bring success – it’s simply a matter of adjusting and putting in the time. Our players were dedicated and we would find a way to improve. Game two. Our second preseason games was against another CFL powerhouse team, the Enid Enforcers. They destroyed us. Our offensive line played better but was still no match for these monsters. With Todd Bowman out, I went with Dakota Sutterfield in the backfield. One thing I learned about Dakota that night is that what he lacks in size he more than makes up for in heart and leadership. Our offensive line played much better and cut the penalty margin down significantly but was just outplayed by a solid Enforcer defensive front. We had an unfortunate incident where one of our best offensive lineman took some swings at an opposing player and was ejected from the game. This, coupled with another off the field incident, led to him being released from the team. Defensively, Coach Reiss had them playing well once again and they held solidly until a few big plays late in the game made the score board look very lopsided at 30-0. Offensively, we couldn’t get the ball moving and, once again, I didn’t adjust properly. Time to improvise, adapt and overcome before the first regular season game against another CFL powerhouse team, the NWA Battle. What could possibly go wrong here? What is a Running Coach? No Replies to "Arkansas Tornados Part One"